Today, I’m going to tell you about some of the top stories that should be on your radar. Pay attention to these three items going forward. All three are actionable trading ideas if you put your thinking caps on. Big Story #1: What’s at Stake in the Latest China-U.S. Trade Talks? The answer is simple: Billions and billions of dollars. Let’s start with how much the tariffs could go up on Chinese imports if China and the U.S. don’t come to a deal. 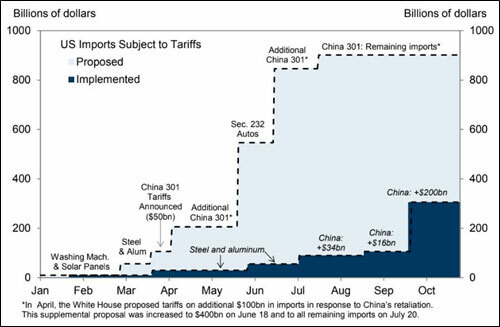 If the U.S. and China continue on the “path of escalation” — a scenario that Goldman Sachs sees as most likely — then U.S. tariffs on remaining Chinese imports will rise to 25%. Guess who will have to pay those tariffs? If you think it’s the Chinese, it’s time to go back to trade school, Bojangles. Nope, U.S. consumers will pay the tab. Now, if you believe this will force U.S. manufacturers to bring more factories back to the U.S., then the long-term gain will be worth the pain. If you think that won’t work, then … ouch! The good news is both President Trump and Chinese Premier Xi Jinping have good reasons to come to an agreement sooner rather than later. President Trump needs a political win. China, too — it just reported its weakest factory growth in two years. The Chinese yuan has fallen as trade tensions heated up. That makes sense, right? A lack of a trade deal hurts China. That country exports $40 billion more to us than it imports every month. Last year, the U.S.-China trade deficit caused nearly half of the annual $800 billion U.S. deficit in goods trade. 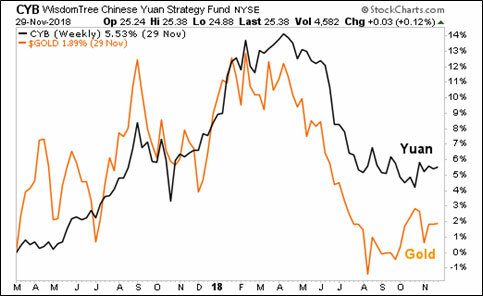 But what many people don’t know is that gold tracks the yuan closely. That makes sense when you think about it, though. China is the world’s biggest gold market. So, what if Xi and Trump DO work out a deal? That will be very bullish for the yuan — and very bullish for gold. On Dec. 6, OPEC will hold its next meeting. The world is looking for some kind of production cut to prop up prices. After playing coy, Russia may get onboard with a production cut. 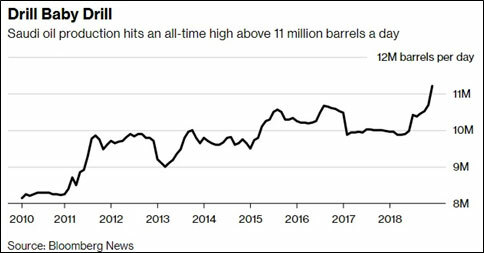 That’s due in part to Saudi Arabia, which recently pushed its daily oil output to 11.2 million barrels. That’s the most ever. Now, this could be due to President Trump jawboning the Saudis to pump more oil. Or it could be the Saudis showing the rest of OPEC who the big dog is going into the meeting. Russia is not in OPEC. But it was key to stabilizing oil prices last time around, when it went along with the OPEC cuts. And just last week, Russia’s energy ministry started discussing potential production cuts with local producers. The world is expecting a cut of 1 million barrels per day, shared among the biggest producers. If the cut is larger than that … well, that could be rocket fuel for oil prices. So, you have potential trades in China, gold and oil, and the companies that are leveraged to them. My best wishes for this next, busy trading week. Good luck and good trades. 2. Reduce government spending and deficit. 3. Don’t allow wages to rise. Invariably after following these, high inflation results and there is general impoverishment. US currently enjoys higher standard of living thanks to cheaper imports and the ability to print money. How long this can continue? If tariffs are raised, one should still expect inflation.